Fig. III-41 shows trends in the percent distribution of juvenile probationers and parolees by reason of termination of probationary supervision in the last 10 years. As regards juvenile probationers, the percent distribution of term expiration declined constantly to 10.8% in 2000, while that of early discharge from probation had been on an upward trend until 1997, and remained roughly constant thereafter. The percentage was high in 2000, at 76.2%. This implies that good-conduct measures have been actively taken for juvenile probationers with good conduct in the course of probationary supervision. As for juvenile parolees, the percent distribution of good-conduct measures was lower than in the case of juvenile probationers, with early discharge from probationary supervision accounting for about 18-22%. This might reflect the fact that a considerable number of juvenile parolees have complex problems. 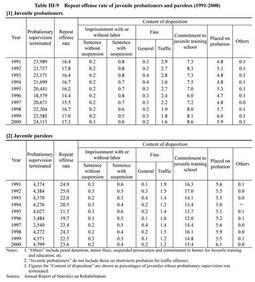 As regards juveniles for whom probationary supervision was terminated in the past 10 years, Table III-9 shows the trends in the repeat offense rate, or in other words, the percentage of those who committed repeat offenses or delinquency (hereinafter referred to as"repeat offense")and were given criminal dispositions (including suspended prosecution)or protective measures (excluding return to juvenile training school) (hereinafter referred to as"renewed dispositions")during their probationary supervision period, and in the content of renewed dispositions. The repeat offense rate tended to move downward until 1996 for both juvenile probationers and parolees. Subsequently, however, the rate has risen constantly for juvenile probationers since 1997, reaching 17.3% in 2000. On the other hand, as for juvenile parolees, the rate saw repeated rises and declines, accounting for 23.6% in 2000, up 1.1 points from the previous year. Also, the content of renewed disposition points to a large percentage of commitment to juvenile training schools, for both juvenile probationers (8.6% in 2000), and juvenile parolees (15.4%). 0.3%of juvenile probationers and 0.2% of juvenile parolees were sentenced to imprisonment without suspension of execution of the sentence as a result of repeat offense.